KIEV, Ukraine -- An exhibition focused on the massacre of 1.4 million Jews in Soviet Ukraine opened in Kiev on Thursday, featuring a sobering display of Nazi bullets, photographs of bones and tearful witness testimonies. 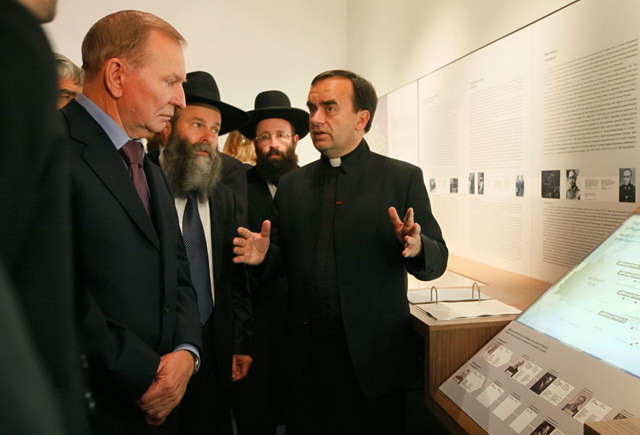 French Catholic Priest Patrick Desbois (R), presenting his exhibition 'Shoah by Bullets: Mass shootings of Jews in Ukraine 1941-1944' to former Ukrainian President Leonid Kuchma (L), in Kiev, Ukraine, Thursday, Sept. 8, 2011. The exhibit is based on the work of French Catholic Priest Patrick Desbois, who has been canvassing Ukrainian villages on a quest to identify hundreds of mass graves of Jews shot by Nazi soldiers and their collaborators during the Holocaust. "Each person deserves to be buried and reintegrated into humanity," Desbois said. "We cannot live like predators next to mass graves ... building modern societies on the graves of people that we assassinated." Historians say some 1.4 million of Soviet Ukraine's 2.4 million Jews were executed, starved to death or died of disease during World War II. Their remains are strewn around the country in common graves, many of them ignored and unmarked. The shooting slaughter of Jews in Ukraine, Belarus and Russia was the opening phase of what became the Nazis' Final Solution with its factories of death operating in Auschwitz and other camps in Nazi-occupied Poland. The campaign began after Germany invaded the Soviet Union in June 1941 and is epitomized by Babi Yar, a ravine in the capital Kiev where the Nazis killed about 34,000 Jews during just two days in September 1941. Ukraine will mark the 70th anniversary of the tragedy later this month. Desbois heads a French Association Yahad-in-Unum, (the Hebrew and Latin words for "together"), which was founded by Catholics and Jews to heal the wounds between the two faiths. He has authored the book, "Holocaust by Bullets," and organized similar exhibitions in Paris, New York and other cities.